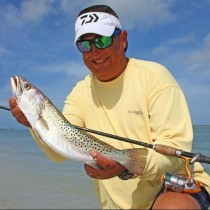 Southwest Florida is riddled with great opportunities for kayak fishing. It’s very likely that you may fish a great area, and not revisit it for a while because there are so many more spots to go. That was recently the story of Pineland for me. Pineland is a small community on Pine Island. It’s the home of the historic Tarpon Lodge and the Pineland Marina. I haven’t fished this area in over a year, but it’s always produced nice redfish and trout. I decided to visit to check out Pineland Marina’s new kayak launch. My brother-in-law and new kayak angling enthusiast Joe Jones and I met Jim Van Pelt at the launch. It turned out to be more of a dock than a launch, so we used the boat ramp instead. The wind was light and produced a ripple on the water, but almost immediately after launching we could still make out the fish moving on the flats. We travelled south to a nice grassy, clear water flats area, where we were met by tailing redfish. I was using an Unfair Lures “Dawgwalker”, Joe was using a spinnerbait, and Jim was using a Riptide paddletail on a jighead. Joe struck first with 25” of well-fed trout. We thought he had a snook until he landed it. After a round of picture taking, the fish was released. Joe was pretty stoked, and ended up catching many more trout on that spinner. I was the next to score, in the form of a nice Pine Island redfish. I was walking my topwater in while looking the other way when I heard a big splash. I looked back to see where it came from and noticed my line was moving erratically. I quickly set the hook and my drag started screaming! After he was done showing off, I landed all 28” of him. After agreeing to take photos, he swam off. Jim wasn’t to be outdone. As we drifted out on the flats, we could see the fish plowing the water in front of us. We kept working at them until Jim enticed one with the paddletail. The 26” fish was strong enough to pull Jim’s Hobie “ProAngler” across the flat before tiring out. We worked the area until about noon, picking up several more redfish, trout, a flounder and a pompano. The wind eventually picked up, but the sky stayed blue. Pineland has always been a great area to fish, and I hope it’s not another year before I visit here. I am an avid tournament angler, competing in local, regional and national events. I am also the President of the Southwest Florida Kayak Angler’s Association. I write kayak fishing articles and reviews for several online resources and kayak fishing magazines. You can usually find me fishing my home waters of Estero Bay or Pine Island Sound, where I has been fishing for over 20 years. I am a member of the Florida Outdoor Writer's Association.